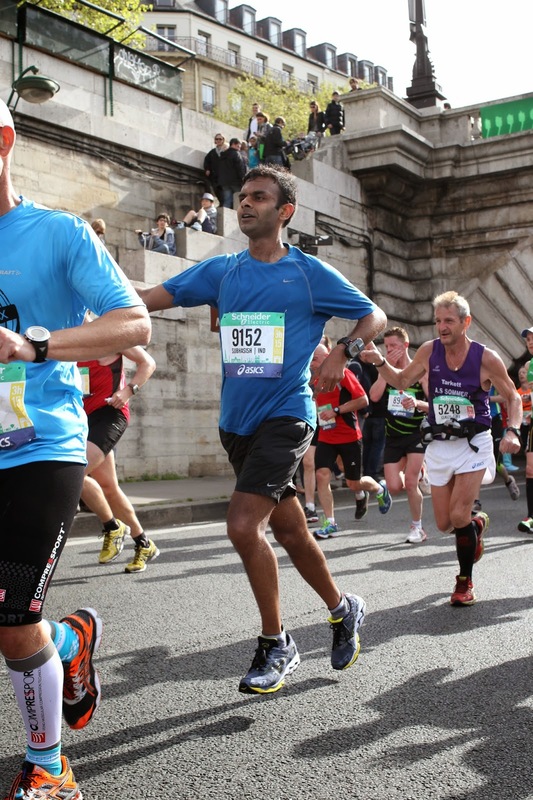 It is relatively easy to run and finish a marathon. 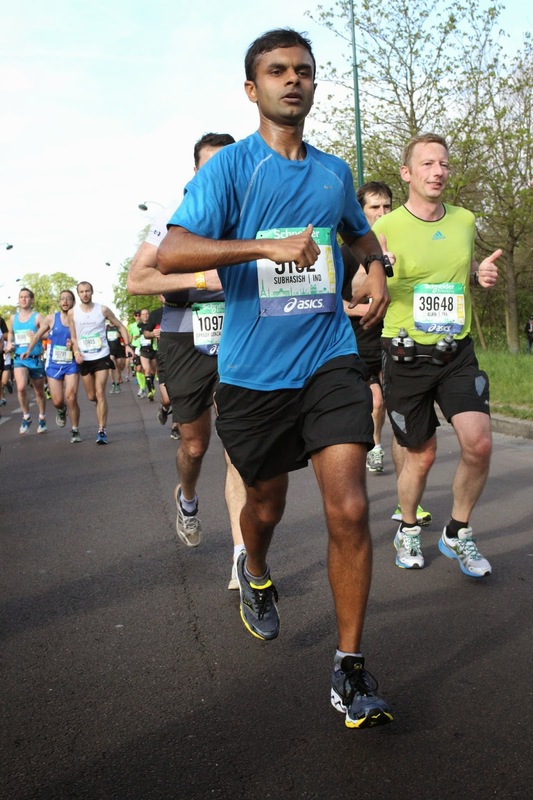 On the other hand it is incredibly difficult to train hard and race a marathon, while giving it your all. An all-out marathon training and execution takes a lot out of me. I've pulled it off about five times in all - my first (2004), Boston (Spring 2005), Steamtown (Fall 2005), Newport (2008), Paris (2011). Roughly about once every three years. Was I due for another such run in 2014? After taking sometime post-Berlin (and letting my niggles heal), I began working on building a base. It seemed unlikely that I would be ready for a Spring marathon. After a month of running, I noticed that I wasn't really that out of shape... Hmmm... So if I had to run another Spring marathon where would it be? Paris of course! I was due to take a month off running in December for a trip to South America. I expected to lose a reasonable amount of fitness. After all isn't that what happens during vacations? I could not have imagined what would end up happening. After four weeks of hiking in altitudes above 11000 feet (reaching about 15500 feet) in challenging terrain I ended in great shape! I had lost about 10 pounds and when I was back in sea level it almost seemed like I had an inordinate amount of oxygen to work with. Runs seemed SO much easier. It would be a travesty to waste such a launch pad for marathon training! I intended to follow the Pfitzinger 12/55 schedule. After a couple of weeks I naturally gravitated to the 12/70 schedule. Given a choice I am a high mileage runner! For the first time in three years I didn't have MBA classes and had some free time. I was able to get in some of my runs in the afternoon (work break). Being able to run in light and during the warmest conditions helps in winter. In spite of trying to optimize the timings of my runs there were a plethora of runs in the wind, rain, sleet and everything that makes us love winter so much :) Track workouts and tempo runs into the wind and rain is not fun!! I did my track workouts around the Microsoft soccer field - this was the most convenient yet lonely option. Also, the Microsoft field being a 200m loop made things very mentally tedious. It's probably something I won't repeat again. My Paris 2011 training cycle had been amazing because at no point did I have to deal with any injuries. That was not the case with this training cycle. I did have to deal with a couple of niggles which went away - ITB, hamstring issues. The one issue that I picked up and stubbornly stayed with me was plantar fasciitis. Oh why oh why did I have to run tough workouts with older shoes - I never learn!! There were times when I contemplated skipping a run but I never did. I made all runs on the schedule and then some... I peaked at 90 miles, averaged 66 mpw and churned 850+ miles this year before the race. If there were a couple of aspects lacking in my training (especially compared to Paris 2011) they were - not having any hill workouts and not having sufficient track workouts. I anxiously counted down to the race. I frantically monitored the Paris weather. These were all good signs which indicated that I had trained hard for the race. The weather predictions unfortunately got worse as the race day drew by. I got to the expo as soon as I left my luggage at the hotel. I have to say I was impressed by how quickly I got my number - I'm talking to you Berlin marathon organizers who make runners wait for a couple of hours. (Yes, I did have my medical certificate and they did check for it. 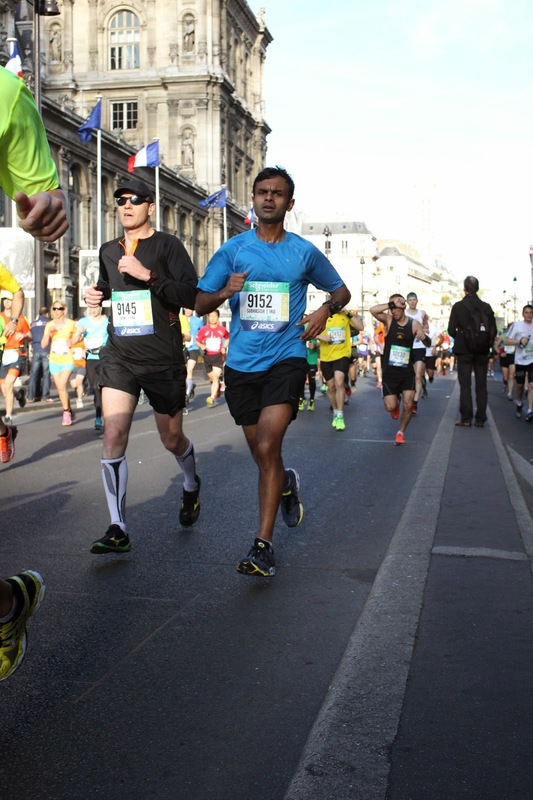 French law requires that all participants in athletic events have a certificate form a doctor. In my case I told my doctor - "Hey, you gave me one of these in 2011 and I am still alive. Maybe you should give me one more :p"). While getting back to the hotel, I got lost and of all places ended up in the Indian town in Paris. None of the folks there could seem to tell me how I could get to Gare d'Nord??? So much for time off my plantar fasciitis infested legs! Once I returned, I headed out on my day-before-marathon 2 miler. It did not feel very good. It was warm. The streets were crowded and in general felt blah... Not the most encouraging or runs. Not wanting to risk on carbo-loading, I had gotten my sister to pack me some rice. That indeed was prudent and saved me some more running about (as much as would have loved to get back to Indian town in Paris!!). I did not want a repeat of the Ethiopian restaurant pre-Berlin marathon which caused me severe discomfort and having to have to take a porta-potty break :) Just in case, I also had a couple of Imodium tabs. I did not sleep very well (perhaps about 3 hours or so and not until around 1 am). I did try to get some rest with my eyes closed. My pre-race nutrition comprised of bagels (that's as safe as it gets for me). My bib color was yellow - i.e. target goal 3:15. It also had my country of citizenship - India and my name. This made for fascinating people watching until the race started. People from so many different countries and so many different time goals! After getting into my corral I decided to stand in the porta potty line. That would prove to be a pivotal mistake. The math was obvious - I would not make it to the front of the line before the start. Instead, it robbed me of the opportunity to get to the front of the corral. That meant I would have to battle the bottleneck for the first few miles! Chariots of fire before the race start ... It never gets old does it? The start was staggered. It was about 4-5 minutes after the race gun that we got to cross. Yes, it was congested. This is a race with about 40,000 runners and thankfully I was ahead of most of them :p Yet, I was having to fight past several slow runners. Quite a few runners with Mexico outfits clearly should not have been so far ahead! I realized that I had forgotten to determine the km pace I needed to target. Thankfully, there were both mile and kilometer markers! This first mile felt warm. Gauging the effort I was putting in I realized that 3:05 was not likely... How about a PR? Paris gives you small water bottles instead of cups. They however, have no energy drinks. I had been pretty impressed with Nuun tables so that was to be my electrolyte source for the run. They definitely taste better than salt capsules... The water stops were crowded and I was losing some time navigating through them. I remember the surreal feeling when I was running the first few miles in 2011. It didn't feel as magical this time around. 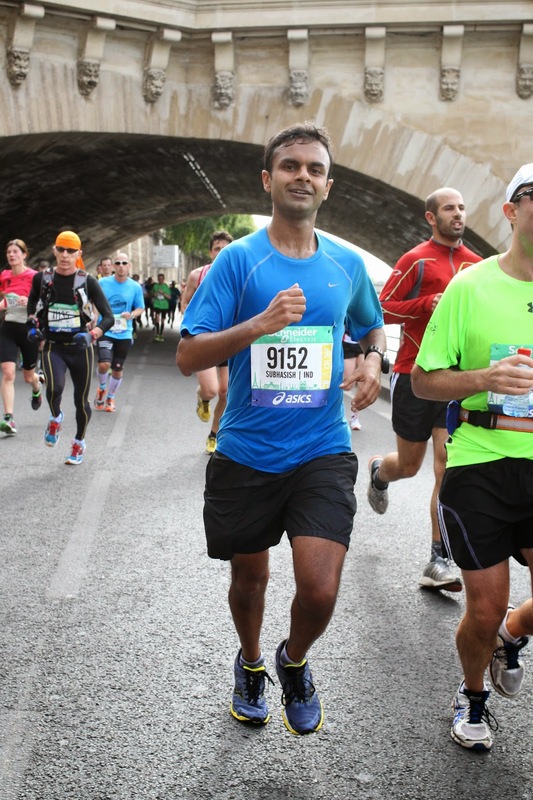 Yet, I reminded myself that I was running through the streets of Paris - how cool is that! I did notice some inclines and declines in the course. I made an effort to push my pace during the declines while trying to hold strong for the inclines. 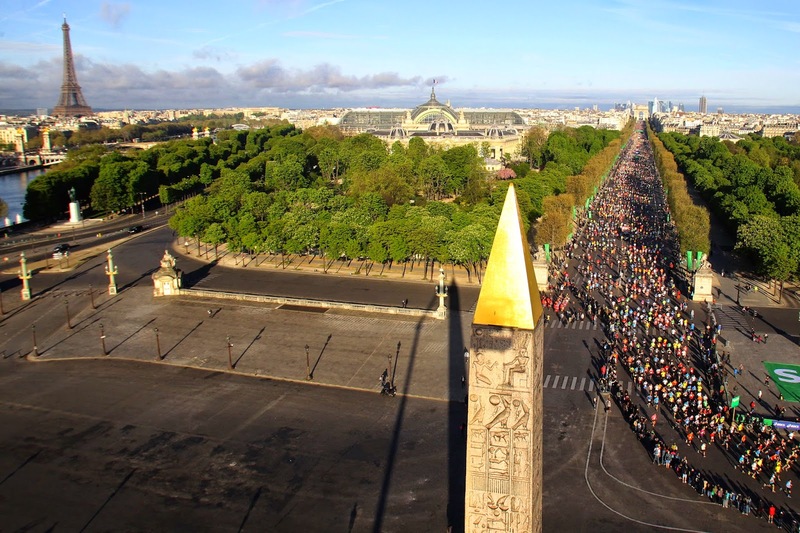 Unlike many other city marathons, Paris does a great job of packing a lot of the important landmarks into the course. For those moments when you are not focused on running it's quite a spectacle. The Paris course has minimal shade so a slight cloud cover did provide a welcome respite. I was off some of the mile markers by quite a bit. That made me wonder if I wasn't doing as good a job of running tangents. The half way mark usually tends to be a good physical and mental gauge for how the rest of the day was going to pan out. Today I was running well and a bonk did not seem likely. Yet, I was not feeling so groovy to run a negative split and beat my PR. At the half-way point I was about a minute behind where I was in 2011. Also, another addition which was not present in 2011 was a sign at mile 18. I must say it's one of the coolest signs you can come across in a marathon. "And there it is - the Eiffel tower!" You look to your left and there it indeed it is!! This video with me (I show up after 55s) in it quite accurately captures the ambiance of what it felt like to be running this race! After km 31 you leave the river and begin making your way back to the finish. The crowd support through out the race was great! You have little kids out to high five you. Constant cheers - "ALLEZ! ALLEZ! ALLEZ!" 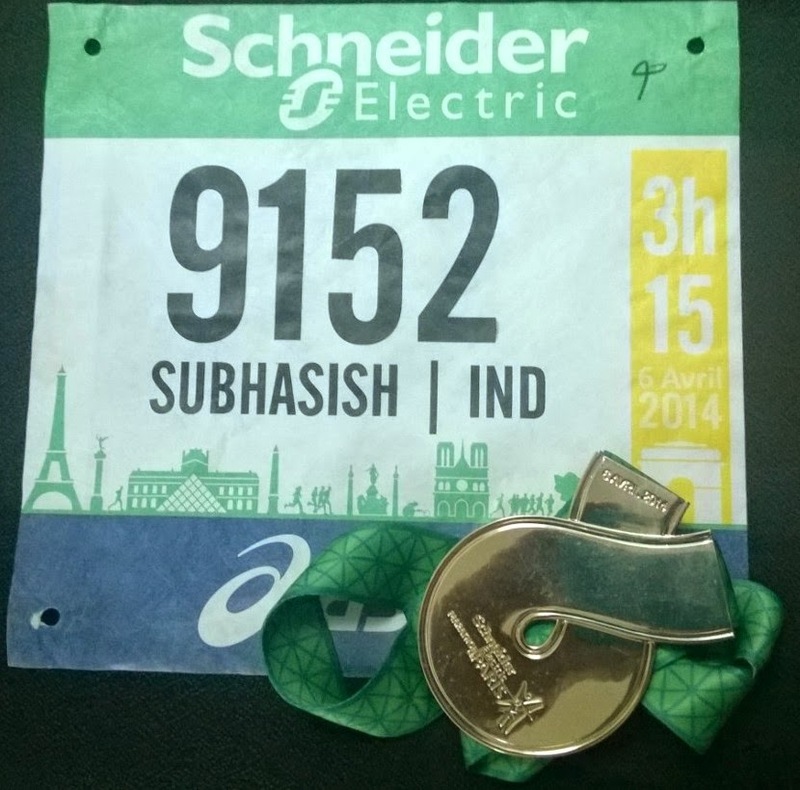 I hadn't had a marathon where I didn't have to walk since Paris 2011. I was glad that this appeared to be a repeat. I didn't muster up something special to get that PR in the final miles. I had a sold finish to my second fastest marathon ever in my 30th marathon. That PR and perhaps sub-3:05 will have to come another day? This felt great. 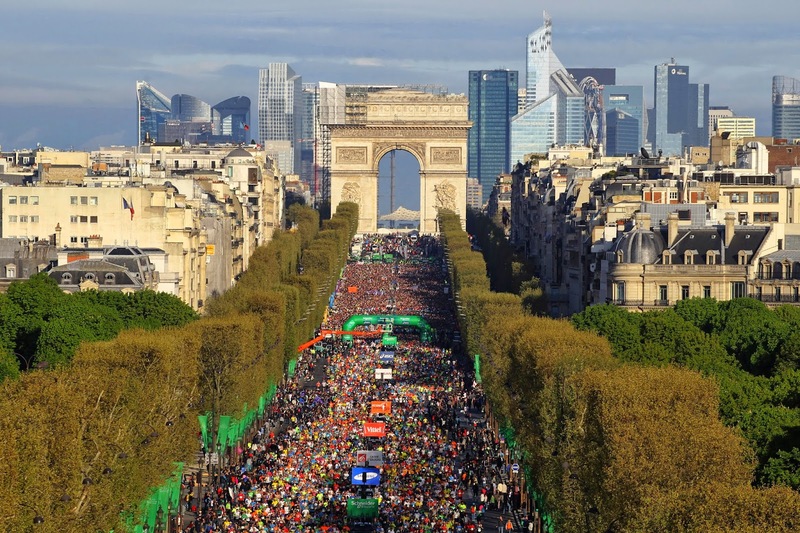 This is how running a marathon should be. If getting to run a marathon like this means that I can only run a marathon or two every year then so be it. Quality not quantity! A glorious morning & an ending!